A fun new way to pick your baby's name together with your partner. More than 64,000 names that you can filter by gender, origin, length and starting letter. Your two phones will pair up and any name you like will be presented to your partner and vice versa. Links tosimilar names, name popularity and further information are provided and will take you to behindthename.com, one of the best given name websites. All names are categorized byregion andorigin. Choose a whole continent with just a tap or restrict your name search to certaincountries orlanguages. You can even choose from differentmythologies andreligions as well as fun collections like "Oscar winners" or "People who went to space". Sometimes you know that you want a really short name. 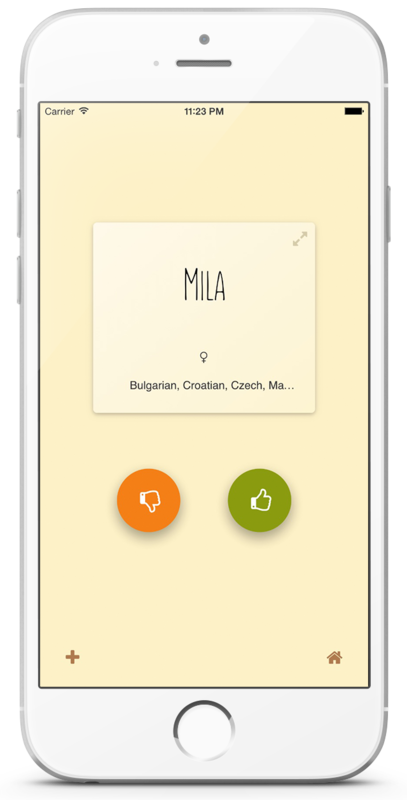 With Max & Mila you can restrict the name search to names of a certain length. Did you make a little brother or sister? Find a name with the same starting letter as your first kid by allowing or disallowing certain characters as the first letter. If you tap like on a name that your partner has liked already, confetti will fly and your partner will be notified of this lucky moment. You found a name! How great is that??? You can browse a list of all matches you have found so far. On that list, you can tap the name to see more information and further links about that name. Or, if you changed your mind you can dislike a name to remove it from your list of matches. My wife and I have very different taste in names, which makes it hard to find a name we both like. To add to that, my wife comes from Catalonia and I'm from Germany. That's twovery different languages. We wanted to find a name that people from both countries are actually able to pronounce. I researched, found a couple of sites with name information and also a couple of apps, but nothing that matched my needs. I wanted to be able to filter out names with certain starting letters, and also I knew I wasn't looking for a Chinese name. And I wanted something that would automatically discover and collect the names both my wife and I like. The matches we have in common. So naturally, I sat down on the weekends and made a little app that fits my needs, and so Max & Mila was born. A small, friendly app that tries to do exactly what's needed to find a baby name, and nothing else. Mike Campbell, who maintainsbehindthename.com. A great resource for all things given names. That's where I send you from inside Max & Mila if you want to know more about a name. Wikpedia, you've probably heard of this. I display snippets of Wikipedia pages with name information. Hoodie, an open source project that helps create offline first apps. It provides the synchronization mechanisms of Max & Mila which keep your phone and that of your partner in sync. Phonegap, a framework that lets you wrap websites as smartphone apps. Appback, a friendly little firm providing a hosted Hoodie environment. Surge, super slick static page hosting - they are the folks serving you this website, for free! My name is Jannis, and I have a very smart and outdated website over atjann.is, you should really not look at it. First off: I store no information that would identify you as a person:No email, no phone number, no social network information, and so forth. I really just store the things that need to get from your phone to that of your partner and the other way around. Since your two phones can't communicate directly, they both communicate with my servers. Anonymous counters for how often which event has occured (likes, dislikes, matches, and so forth). These statistics help me determine if the app actually works, or if people get stuck somewhere. I'm always happy to hear from you, feel free todrop me a line.